Caring for a sick budgie is a lot like caring for a sick child. 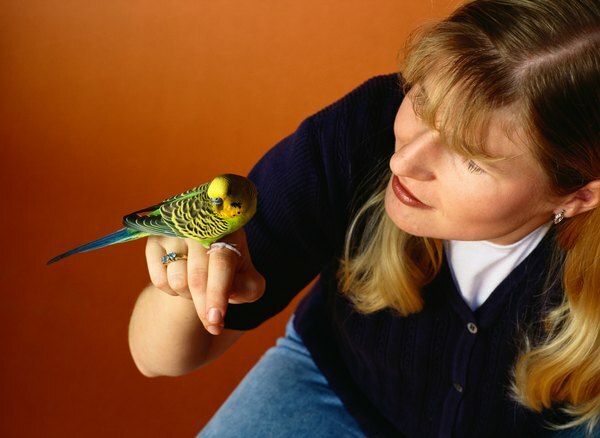 Budgies are fun and friendly little companions, and it's upsetting to see yours hurting. With veterinary attention and some TLC at home, a sick budgie usually stands a good chance of getting back to his charming and entertaining self. Budgies tend to hide the fact that they're sick. By the time you notice yours isn't feeling well, chances are he's been fighting illness for a while and it's become so advanced that he can no longer hide it. Recognize symptoms so you can help your tiny pal early. Symptoms that should trigger your concern are respiratory problems, dry or swollen nose, abnormal or bleeding feathers, drooping head, lethargy and weakness, inability to perch, vomiting, weight loss, detectable lumps or swelling, and discharge from the eyes, beak or nostrils. These are all signs of critical illness; see an avian vet immediately. Symptoms such as appetite loss, diarrhea or abnormal droppings, fluffed up or untidy feathers, changes in behavior or sleep patterns, disorientation and drinking excessive amounts of water are less serious but still cause for concern. A symptom to watch for in male budgies is a change in color of the cere, the nose, from blue to brown, which could be a sign of testicular cancer. Birds have fast metabolism; they expend lots of energy and resources maintaining body temperature around 104 degrees Fahrenheit. Keeping heat on your sick budgie, between 85 and 90 degrees, will help to free up his body's resources for fighting off illness -- but monitor closely and turn down the heat if he appears too hot or pants. Once he's better, turn down the heat gradually, about 5 degrees per day, until it's back to room temperature. For respiratory illnesses, it's important to provide humidity with a vaporizer or humidifier. If neither of these is available, place his cage in the bathroom and run a hot shower to steam up the room on a regular basis. A sick budgie might not drink as much water as his body needs while he's sick. To keep yours from becoming dehydrated, use a syringe, dropper or finger to give him fluids regularly. Infalyte or other electrolyte solutions for infants are good choices, as are apple juice, grape juice or boiled water sweetened with a little honey. Avoid Gatorade for its high salt content. Make sure he continues to eat during his illness, even if you have to feed him by hand or force feed him through a syringe. Without regular feedings, a sick bird can starve in a short amount of time. Good foods for a sick bird are both easy to digest and high in carbs, such as baby food or infant rice cereal. Provide your sick budgie peace and quiet. Do what you can to promote rest. You may place his cage in a quiet room and remove his toys and anything he might climb on. If he shares the cage with another bird, place him in a separate, isolated cage during his illness. Keep his room semi-dark; limit activity as much as possible. If the vet prescribed antibiotics or other medications, make sure he takes the full course even after he appears to feel better. Just as birds try to hide sickness at its beginning, they'll also try to appear better toward the end of it, even though they still need time to heal. 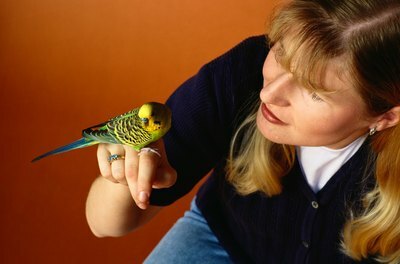 For this reason, return your budgie to his normal routine gradually, monitoring him closely as you go. What Does It Mean When My Parakeet Is Throwing Up Seeds?